1926, 9¢ rose, rotary, o.g., never hinged, perfect centering with beautifully balanced margins all around, vibrant color and pristine freshness, Superb, a wonderful gem, with only three examples grading higher; with 2017 P.S.E. certificate Graded (Superb 98, SMQ $650). 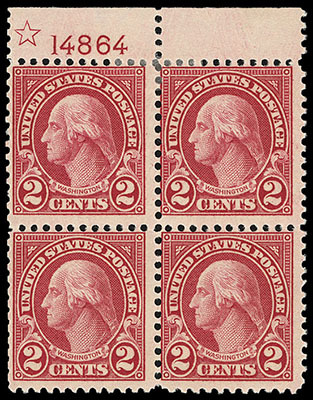 1925, 10¢ orange, rotary, o.g., never hinged, perfectly centered amid evenly balanced margins, rich radiant color and pristine freshness, Superb, a stunning P.O. fresh gem; with 2003 P.F. certificate. 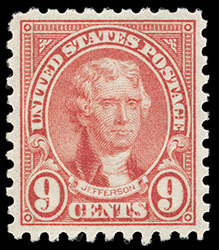 1923, 2¢ carmine, rotary coil waste, o.g., never hinged, rich deep color, Very Fine and choice; with 1998 P.F. certificate. 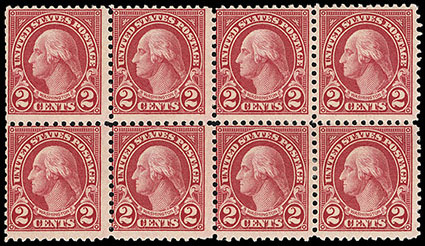 1923, 2¢ carmine, rotary coil waste, block of 8, o.g., bottom right pair h.r., others never hinged, rich bright color, some short perfs at left, about Fine, a scarce large multiple. 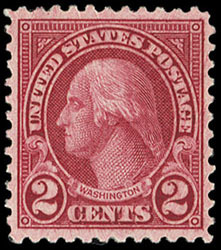 1923, 2¢ carmine, rotary coil waste, top margin plate no. 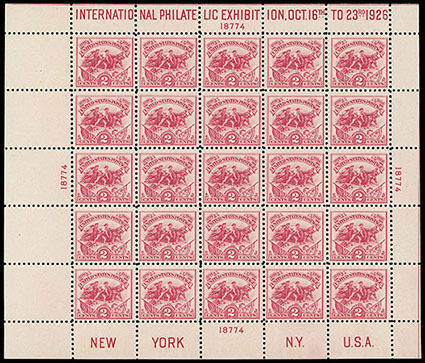 "14864" block of 4 with star, o.g., top stamps small h.r, bottom stamps never hinged, fresh and Fine. 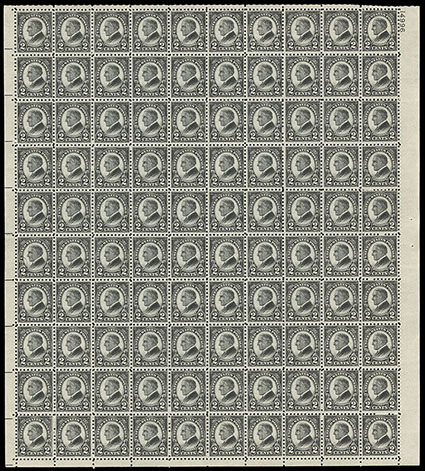 1923, 2¢ Harding, rotary, complete sheet of 100, o.g., never hinged, fresh and intact, F.-V.F. Scott No. 612 $3,250 for singles. 1924, 5¢ Huguenot-Walloon, left margin plate number "15753" single, o.g., never hinged, gem centering within large evenly balanced margins, fresh with deep color, Extremely Fine to Superb; with 2007 P.S.E. certificate Graded (XF-Sup 95, SMQ $210). 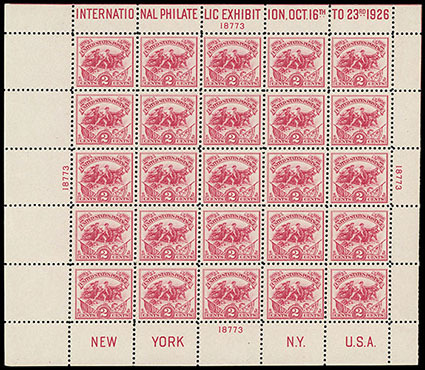 1926, White Plains souvenir sheet, dot in "S" variety, position 9 variety, o.g., never hinged, bright and fresh, Very Fine. Scott No. 630 var. $650. 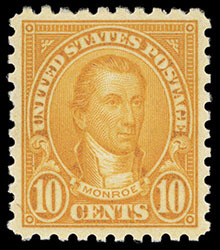 1926, White Plains souvenir sheet, dot in "S" variety, position 11 variety, o.g., lightly hinged (one stamp), bright and fresh, Very Fine. Scott No. 630 var. $400. 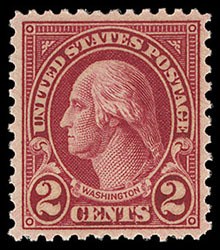 1928, 2¢ carmine, rotary, type II, o.g., never hinged, choice centering amid well balanced margins, deep color, Very Fine and choice; with 2001 P.S.E. certificate.